Melissa suggests this bracelet could have a shark on it. Perhaps Anna's mom is a little unclear about her maritime anatomy. I bet she lost it on porpoise. and shouldn't that be "bought" not "brought"? 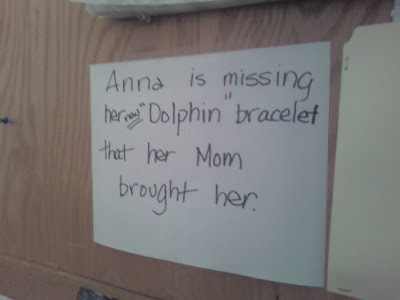 How do you know the bracelet doesn't say "Dolphin"? You know ... "dolphins" ... they're a type of "fish". Dolphins, you know, chicken of the sea. It's like saying that the bracelet is a knockoff: Yeah, she lost her "Fendi" handbag. I'm pretty sure anatomy was not the word you were looking for. Does it have Dan Marino charms on it? LMAO! "Thanks", Pink. I almost just wet myself!